I’m sort of a newbie over here when it comes to things like Thai/Korean/Vietnamese food. I’m the girl who never strays far from the Chinese food basics: fried rice, sesame chicken, beef and broccoli, etc. Maybe it was because I grew up in a small town where ethnic food was the local Dragon & Phoenix restaurant (delish, by the way, so sad they closed), where I was able to gorge on cream cheese wontons which I dunked in a bowl of translucent red sweet and sour sauce. It was the best, and honestly, I have to make those wontons myself now because 99.9% of the Chinese restaurants I visit only sell them with imitation crab in them, and that is big no freaking way in my book. I kind of went off on a tangent, huh? Anyway, this ginger curried vegetables recipe is about as simple as it gets for me, but it is so fresh and delicious, flavorful and exotic, and it takes, literally, 15 minutes to make, since really all you do is stir-fry the vegetables for a couple of minutes, until they are just barely tender. All the yum, right here. 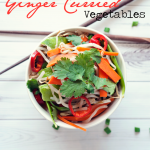 Ready to try some ginger curried vegetables? I hope so! Slit the chile lengthwise and cut out the seeds and membranes, then slice into thin rings. Peel and finely chop the ginger and garlic, then trim and slice the green onions. Trim the snow peas, then cut into thirds diagonally. Peel the carrots, then cut into thin strips lengthwise, then slice as thinly as possible. Rinse the bean sprouts in a sieve and drain well. Heat the oil in a wok over medium-high heat, then add the chile rings, ginger and garlic and stir-fry lightly. Add the carrots and snow peas and stir-fry for 2-3 minutes, then add the green onions and continue to stir-fry for another minute. Add the coconut milk, curry paste, and soy sauce and heat through, then add the bean sprouts and heat for another 2 minutes. Roughly chop a few leaves of fresh cilantro and sprinkle over the vegetables. Serve and enjoy! Do know that this recipe can be quite spicy, so adjust the curry paste and chili peppers to taste. This recipe is perfect for lunch, because it’s light, but still packs enough protein and carbs to keep you going, without making you feel weighted down and tired. I hope you’ll give it a try sometime!